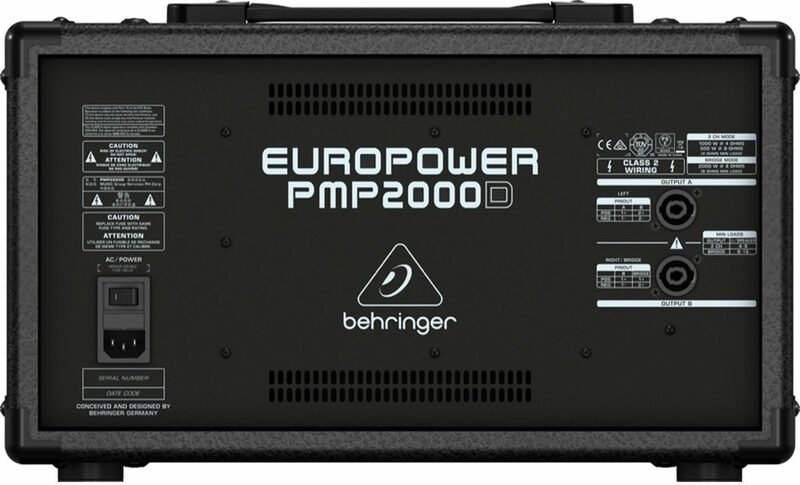 The amazing Behringer PMP2000D Powered Mixer packs 2,000 Watts of high-efficiency Class-D output power, while maintaining an incredible power-to-weight ratio. With 14 available input channels, the PMP2000D features 9 of our premium-grade "Invisible" IMP mic preamps with switchable +48 V phantom power, 4 stereo channels, an ultra-high quality KLARK TEKNIK FX processor with 25 presets including studio-class reverbs, delays, pitch shifter and various multi-effects - and dual 9-band stereo graphic EQs. Top it all off with "Wireless-ready" operation, thanks to our high-quality ULM digital wireless microphones (sold separately), and the PMP2000D is the ideal, easy to use, and ready for anything live sound solution! 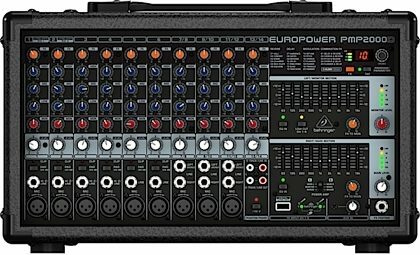 The EUROPOWER PMP2000D's six mono inputs (plus 3 of the 4 stereo channels) feature our ultra-low noise, high-headroom IMP "Invisible" mic preamps, which have been praised by audio professionals all over the world. These studio-grade mic preamps off er a staggering 130 dB of dynamic range, with a bandwidth that extends from below 10 Hz to over 200 kHz, and are perfectly matched to every conceivable microphone - with up to 60 dB gain and a +48 V phantom power supply. Armed with these superb mic preamps, the PMP2000D provides exceptionally-transparent and crystal-clear sonic performance - making it the ideal choice for both live sound and studio recording applications. BEHRINGER is proud to incorporate custom-engineered KLARK TEKNIK effects into their products. Featuring 25 world-class presets to choose from including reverb, chorus, flange, delay, pitch shift and many other amazing effects, KLARK TEKNIK created the 24-bit, studio-grade effects engine for BEHRINGER - to give your performance that truly professional finishing touch. The ULM wireless system combines professional-quality sound with simple setup and an intuitive interface for legendary audio performance right out of the box. Just plug in the ULM receiver "dongle", and instantly you have an exceptional wireless mic system. Freeing you from cables is the simple and easy way to own the stage. Use the 2-Track RCA inputs to feed in external stereo signals; conversely, the 2-Track RCA outputs can be used to send line-level signals from the mixer to a recording device. Powered outputs on the PMP2000D are available in the professional, twist-lock Speakon-compatible variety. In addition you'll find a convenient 1/8" (35 mm) Aux In jack for connecting your smartphone or mp3 device for playing backing tracks, or prerecorded music during your breaks. 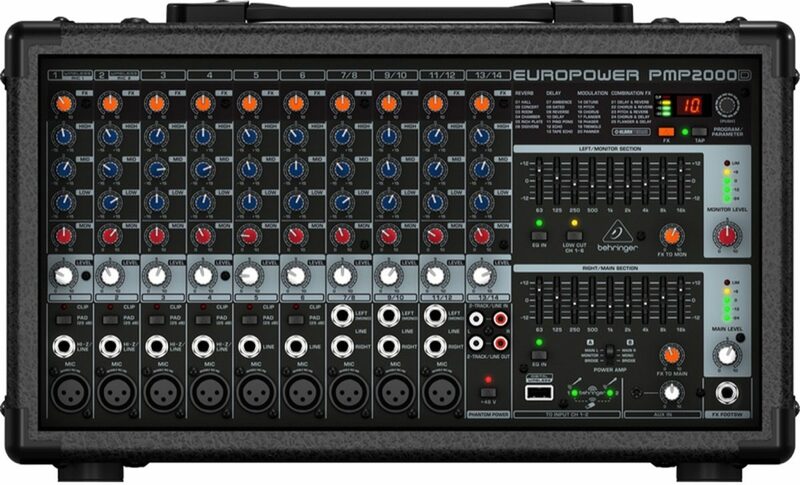 Medium-sized events call for the lightweight PMP2000D (19.4 lbs/8.8 kg), easy-to-use 14-channel, 2,000-Watt powered mixer - the most efficient and affordable powered mixer for the job. With its highly-acclaimed IMP "Invisible" mic preamps, 24-bit KLARK TEKNIK Multi-FX processor, "Wireless-ready" operation and dual 9-band graphic EQs - the PMP2000D makes it easier than ever to lend exceptional sound quality to all of your performances. 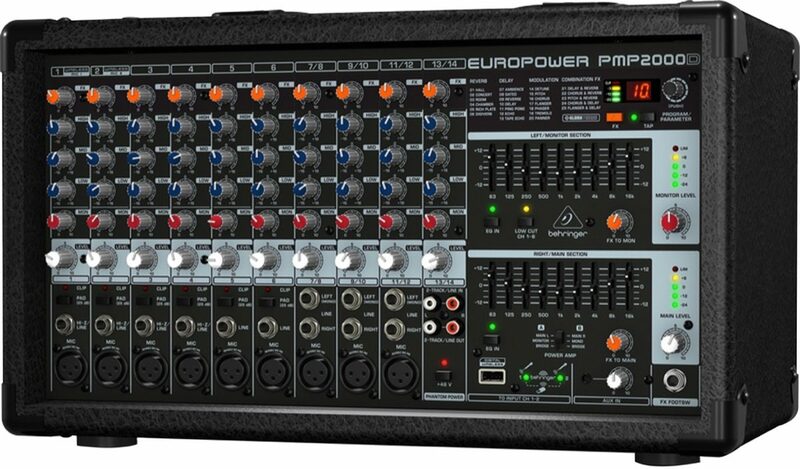 "Just what I needed - Power, ease, portability"
Overall: Received this unit and Power a massive Peavey Speaker Array, in a 40 by 80 garage. Clean, crisp power with awesome effects. Hook your phone or ipad dial your favorite songs, sit back ad relax. Have miked the lead guitar, base, drums, and B3 up - blown it through the Peavey array with 4 vocal mikes - the Behringer PMP2000 brought it!!! Overall: I paired this with a pair of Peavey PV215 speakers and I've only setup in my basement for four piece classic rock band. I planned on using mainly as a practice P.A. so we could leave the gigging P.A. packed until needed as it is alot of work setting up and tearing down. First off setup and dialing this system in is very easy and fast. I found a clear sound with more than enough bottom for our needs . 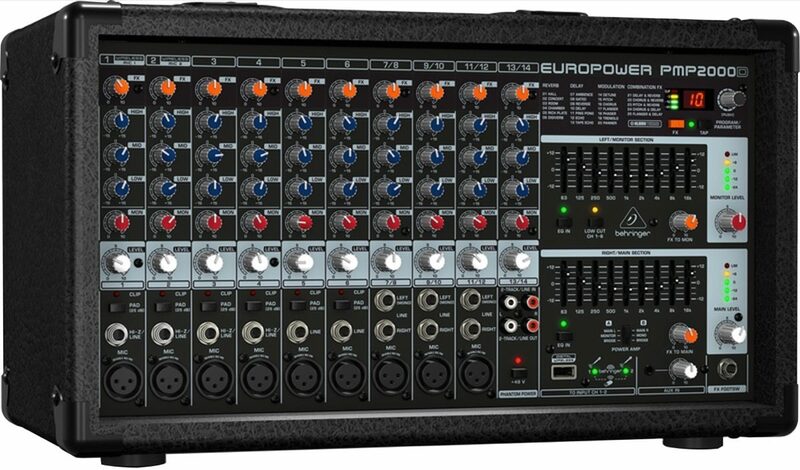 There's enough inputs for bass , guitar , drums and three vocals. I'm sure that this very small system could cover most bars we will book. I'm surprised that this setup isn't shown as a pre-packaged system . My initial thoughts are this unit is a home run for us , time will tell how durable it is but so far clean , powerful and easy sums it up. Style of Music: Most forms of rock , blues a little country.